The Inca Trail is without a doubt one of the most famous treks around the world. The trails, laid by the Incas over 500 years ago, cross through some of the most beautiful and inspiring Andean sceneries, subtropical jungles, and ancient Inca ruins and tunnels. But, its beautiful and inspiring qualities are paralleled by its physical challenges. 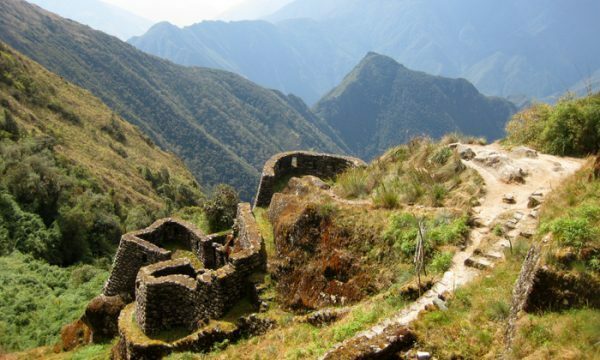 The most famous trail is known as the Classic Inca Trail. 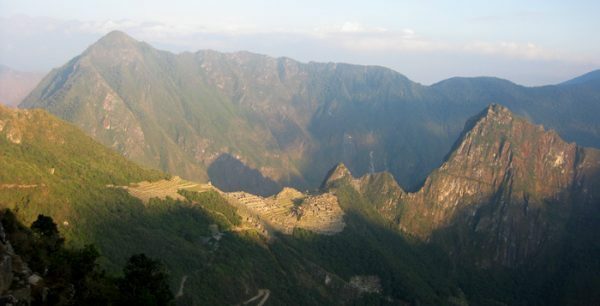 It is 47 km long, starting at Piskacuchu (km 82) and ending at Machu Picchu. This trail gets really crowded, so you must reserve your spot with weeks or months in advance. There are many other trail options in the area, but the Classic is the only one that ends at the Sun Gate (where you see the sunrise over Machu Picchu). For this particular reason, the Classic Trail is the one most recommended. On the other hand, other trails are cheaper and not as crowded but are equally impressive and even more challenging than the Classic. 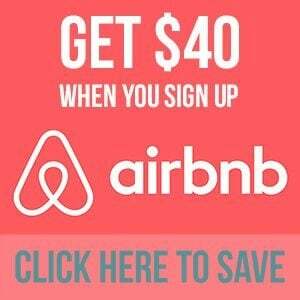 In addition, these can be easily reserved in Cuzco the day before starting the hike. 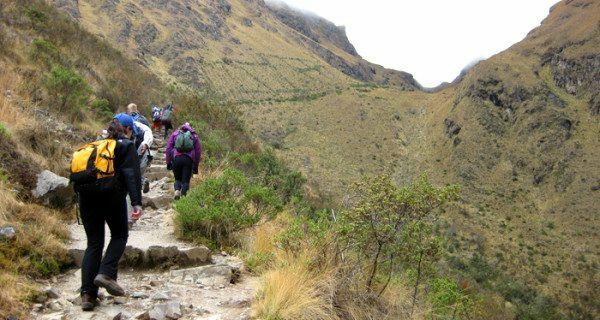 To get the most out of the experience of hiking the Inca Trail, there are a couple things you might consider doing to prepare yourself, not only for the physical demand but also for the mental challenge. Strengthen your leg muscles by stair climbing and walking up hills. This helps endure the strains of treading many miles over rugged terrain with slopes and difficult climbs. Carry a backpack with added weight while exercising. Start light and increase weight depending on your comfort level. Adding weight to your backpack enables you to prepare your back muscles as well as develop upper body strength. 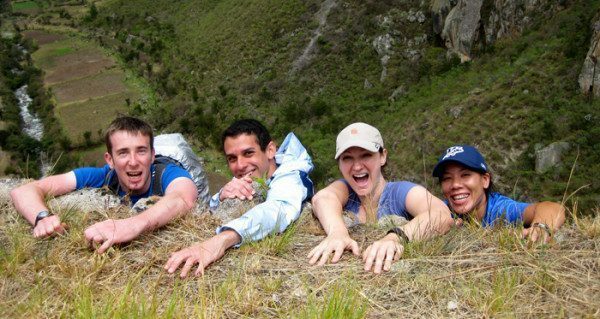 If possible, mimic the hiking conditions of the Inca Trail. Find rugged terrains, long and steep uphills and downhills near home. Hike them for a few hours. Inca Trail hikes last approximately 5 to 7 hours each day. Altitude is a factor. Arrive at least two days before starting the trek to acclimatize to the high altitude. Once at the trail, drink coca teas at every meal, if possible, and chew coca leaves on the second day – when you cross the highest pass of the trail. Breathe well when walking. Due to the high altitude, the air is thinner than what you are probably used to. Take a break every now and then to catch your breath. When hiking uphill, walk in a zigzag pattern. This slightly reduces the gradient of the trail. Also, take small steps to reduce the effort per step to push your body. When hiking downhill, slow down by leaning back a little and putting your weight down through your heel. Be particularly careful on very steep descents especially in wet and loose stones. A useful technique is to stand side on and to go down one step at a time. Use a walking stick if necessary – they reduce 30% of the weight on the knees. 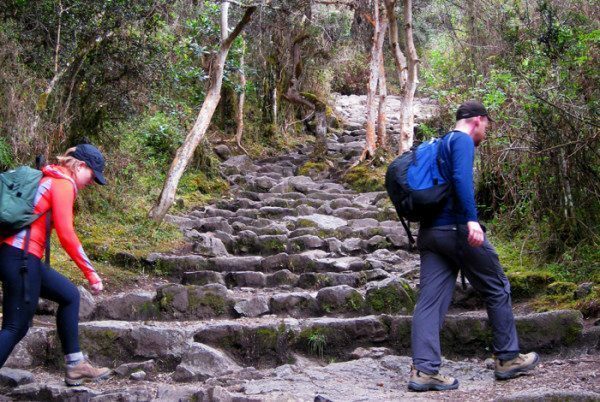 When hiking through the Inca steps (second and third day), take short breaks after every couple steps. These are the most challenging parts of the trail – physically and mentally. After every break, set the goal of where you will take your next break (i.e. the next big bush 12 steps ahead), and don’t take your sight out of the goal. It’s a great feeling to accomplish all those mini goals. Go at your own pace and don’t force it. Don’t feel the need to catch up with the rest of the group, as there is no rush to get to the campsite. Eat well, you will be burning a lot of calories. No matter which company you choose to go with, they will feed you well. Take power bars, candy, and snacks that won’t weight much in your backpack. Drink 1.5 liters of water (minimum) each day to stay hydrated. Having a Camelbak or Platypus inside your backpack helps. Stretch your arms, legs, and back at the end of each day’s walk. This will loosen contracted muscles and reduce the pain from the strain. Be smart with your packing. Go as light as possible and have your snacks and daily necessities in easily accessible pockets or within easy reach. Bring appropriate clothing. No matter what time of the year you go, chances are that it will get cold during the night (even during the day if cloudy) and that it will rain. Have a waterproof jacket, pants, and comfortable boots (you don’t want blisters). Dress in layers and keep them accessible in your backpack, since you will be putting and shedding layers many times during the day. Take a look at what I packed for the trail. If cold, walk around or eat chocolate to warm up your body. Eat a bar of chocolate when crossing the highest point – Dead Woman Pass. The temperature can drop to 0 degrees Celsius. Once at Machu Picchu, sit down for an hour and enjoy the view. This is your prize, but before running through the ruins like a kid, you should eat a snack and get your “revolutions” down from the morning hike (you don’t want to be lightheaded). And last but not least, do appreciate the scenery and Incan Culture while hiking. That’s probably the reason why you are there. If possible, educate yourself a little about their history and culture so you have some background before you go. Still, most guides are very knowledgeable, so they will tell you all the facts you want to know. Read the recap of my Inca Trail experience with Gap Adventures; starting at The Sacred Valley, the going through the Four-Day Hike, and finishing at Machu Picchu. In my opinion, the Inca Trail can be successfully hiked by any person with an average physical condition, but the more prepared you go, the better the experience will be. Have you hiked the Inca Trail? Any other tips you would add to the list? Great tips. Hiking the Inca Trail is one of the highlights of our year away. It was absolutely awe-inspiring to be out there and learning about the amazing work and culture that built it. Thanks Gillian! I loved learning about the Inca culture while doing the hike. 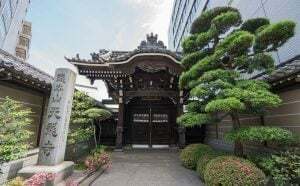 It adds so much to the experience because it is another way to absorb their culture. I like your suggestion to eat a bar of chocolate when hiking. I’m down for that! Hey Guys, great job on this list! I think this is one of the most fantastic Inca Trail recommendations I’ve seen out there. So many people get worried about altitude prior to trekking, and following these steps will certainly make the experience more enjoyable. Boy, you guys sure got a payoff once you got to the top. Phenomenal views! You definitely do get a payoff once you get to Machu Picchu! What a marvelous place! A very comprehensive list with important details when climbing this trail! This is something I really want to do and will keep your suggestions in mind. Great list, I just jotted down some notes as I am leaving for Peru in less then a month(!!). I like to think I am of average physical condition, so I’ll take any tips I can get! 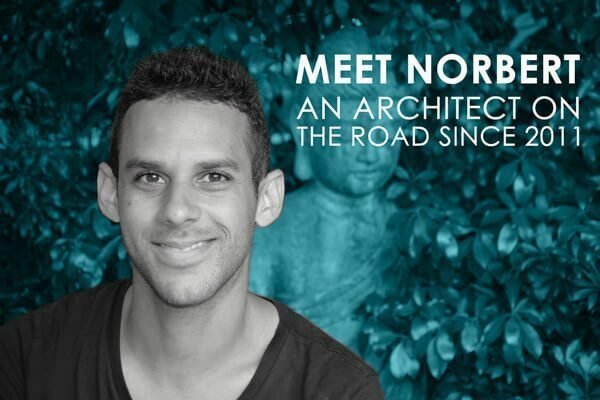 Great tips Norbert! I know this is a grueling hike. These are good tips for any tough hike so I might even use a couple of these when I go later this summer. Thanks Jeremy! You’re right, these tips do apply for any hike, anywhere. Awesome tips! I’m (hopefully) going to hike the Inca Trail with my sister next spring, so this will come in handy! Great tips! Will have to get back to this one whenever I do the Inca trail in the future! Good information. I have this trek penciled in for next year. When is the best time to go? So cool you’re planning to go next year! I think the two best months to go are May and September. You have better chances to have sunny days (although you will always have rain showers, no matter when you go) and a comfortable mild temperature. I can’t wait to do this trail!!!!! Jade, I don’t get tired of saying how amazing is the Inca Trail. I look forward for you to do it!! I am leaving for Peru in about 2 weeks, am trying to understand the incline on the trail so I can adjust my work outs. It the trail – especially on day 2- a 5% incline steep or a 9% incline steep? Hi Joni – Unfortunately I don’t know the incline percentage-wise, but I do remember the second day being the toughest, not because of the incline, but because of the steps. Great tips. We (a group of 4 in our late 50’s and early 60’s) are booked on a trip to Peru including the Inca Trail Early June 2019. We are all reasonably fit and are looking forward to doing the trail which has been on my bucket list for a. long time. I will take your tips on board. Have you any other advice which is more age related before we go and for the trail itself?